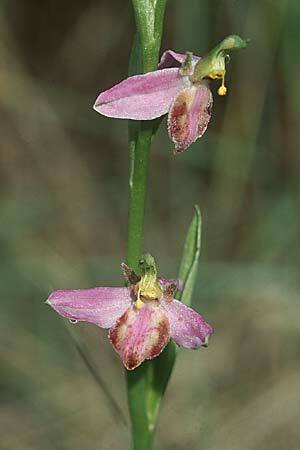 This strange variety of the bee orchid was described as Ophrys apifera var. tilaventina by the Italian botanists U.NONIS and P.LIVERANI in 1997 from the Province of Friuli. GIROS Notizie 18 (2001) reported further findings in the Provinces of Treviso and Lombardia. The name 'tilaventina' reminds at the old Roman name Tilaventum of the river Tagliamento. But the orchid should better be called by the old name 'purpurea'. It occurs in wide river valleys of the Southern alps and further Southern regions nearby, where it grows on banks of gravel, which the river transferred out of the alps. The images of this page have been taken at the bank of the Tagliamento near Trasaghis in the Italian Province of Friuli on 2-Jun-2004. But by far this was not the beginning of the history: The orchid was already known in the century before last and interpreted in completely different ways during the course of time. 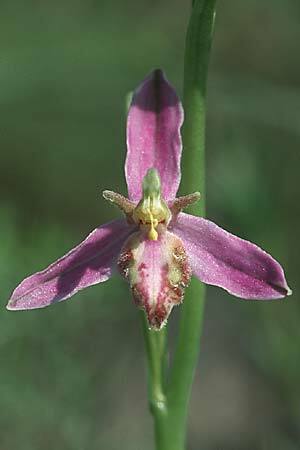 Already in 1831 it had been described as Ophrys purpurea by Ignaz Friedrich TAUSCH (1793-1848) in Flora 14(1): 222. Found near Treviso by SACCARDO several times, first taken as a good species, later interpreted as Ophrys x Serapias hybrid. Similar forms from the region of Trento, which GELMI assigned to O.integra in Bull. Soc. Veneto-Trentino Sci. Nat. 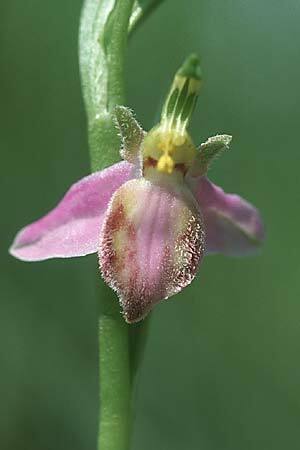 III, 4: 186 (1886), and which he assumed to be a hybrid between O.apifera and Cephalanthera rubra (! ), are identical with O.apifera var. purpurata (TAUSCH) REICHENBACH FIL., Icon. 13/14: 97 (1851). O.integra and O.apifera var. purpurata are however neither generic hybrids, nor, as M.SCHULZE and G.KELLER were assuming, peloric anomalies (reorganization of the bilateral-symmetrical construction of the bloom to the radial-symmetrical one). Instead they can be placed into the proximity of var. trollii forms of O.apifera. The labellum of O.integra shows the most advanced reduction regarding lateral lobes, appendix and speculum. In 1968 O.apifera var. purpurata has also been found in the Swiss Kanton Ticino by H.HENTZ, Zürich."